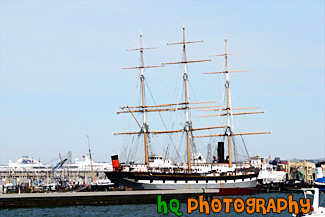 A scenic picture taken of the big Balclutha boat located in the San Francisco bay of California. A cruise ship can be seen in the background. On January 15, 1887, with a twenty-six-man crew, Balclutha sailed under British registry from Cardiff, Wales, on her maiden voyage towards San Francisco. The ship entered the San Francisco Golden Gate after 140 days at sea, unloaded cargo of 2,650 tons of coal, and took on sacks of California wheat.